THE LATE LATE TOY show was the most watched programme on Irish television this year. More than 1.3 million people tuned in over the weekend, that’s 72% of the total audience watching television at the time. A further 107,000 viewers watched their recording of the show on Saturday and 42,000 viewers did the same on Sunday. 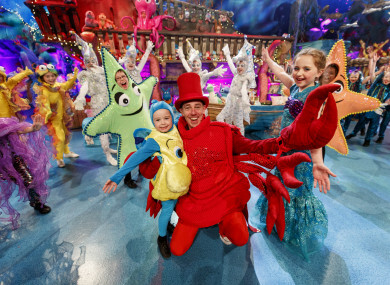 Nine out of ten children watching television on the night were tuned into the Little Mermaid themed show, hosted by Ryan Tubridy. In addition, the Saturday repeat of the show was watched by an average audience of 134,300 viewers. Host Ryan Tubridy said: “It never ceases to amaze me how many people hold The Late Late Toy Show so dear. The fact that so many people let us become part of their world over the weekend is really heartening and the reaction I have been getting from people since the show has been overwhelming. Last Friday night’s show is on course to become one of the top ten programmes on Irish television this century when full consolidated viewing figures are tallied next week. The show was watched in 109 countries outside of Ireland with viewers logging on across the globe from Germany to Fiji, Russia to New Zealand, and Mongolia to the island of Réunion in the Indian Ocean. The show was also streamed in Mali where, no doubt, the Defence Forces personnel, serving alongside Sgt Graham Burke on a peacekeeping mission, watched as he was reunited with his family live on the show. The audience peaked at 1.34 million viewers and the show had a reach of 1,732,500 viewers who tuned in for a minute or more of the broadcast. Email “Friday night's Late Late Toy Show was the most-watched Irish programme this year ”. Feedback on “Friday night's Late Late Toy Show was the most-watched Irish programme this year ”.